So I've done some more work on my sofa table design and I'm feeling alot better about the whole thing since I've added some personal touches. As you can see in the photo, I've incorporated breadboard ends and a crest rail on the top, added wedged through tenons on the side stretchers and changed the door joinery from a through mortise and tenon to pinned miters. For some reason that big top just didn't feel right without a crest rail on it and after a few different designs I settled on the one in the picture with a very low profile that enhances the horizontality of the piece. I'm considering putting a series of square holes in similar to those I incorporated into the crest rail on my nightstands (previous blog post) I'll put some more thought into that but I'm scared to overdo it with the craftsman details. The breadboard ends I added to help keep the top flat, because I really like the look of them and frankly because I've always wanted to try and build them. I extended the tenons on the side stretchers and turned them into wedged through tenons. I still plan on using ebony wedges (If I can find some) The tenons are 1/2" thick and I may still play with their proportions to get the top and bottom of the top tenon to line up with the depth of the drawer. The pinned mitres on the doors I saw in Fine Woodworking issue #200 in an article by Russell Jensen. This is a traditional japanese joinery technique called "kane tsugi" that I find very beautiful. I'm pretty pumped to try and make this joint. Of course, I had to pass all of the design ideas by my better half to see if she'd veto any of these decisions. She was a bit unsure about the pinned mitres because she felt that it was a bit too much but after a few seconds changed her mind. phheuw! What are your thoughts on them. Below is a picture of the piece with the regular through mortise and tenon joints on the doors for comparison. 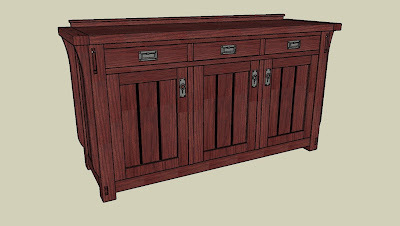 Gain instant access to 16,000 woodworking designs. 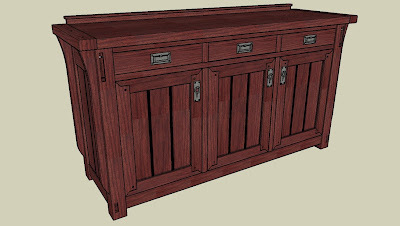 Teds Woodworking has more than 16,000 woodworking plans with STEP BY STEP instructions, sketches and drafts to make all of the projects very easy.